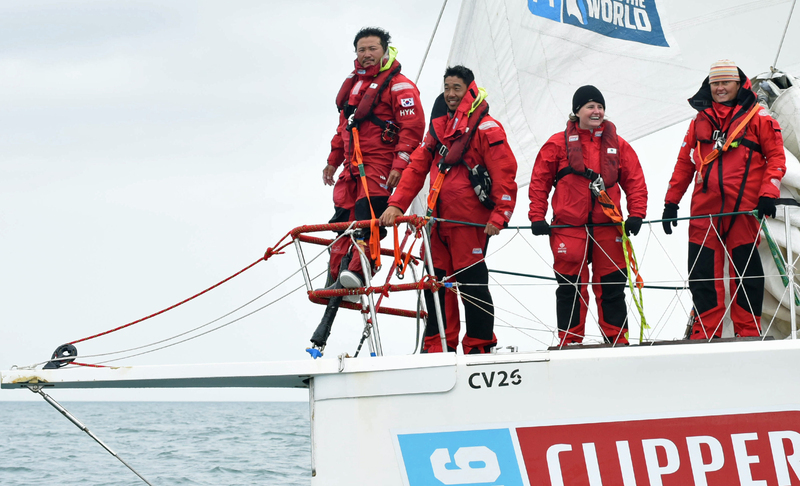 The 700 crew competing in the Clipper 2015-16 Race represent 44 nationalities, including just one South Korean. Han Kim is the first person from his country to sail around the world in the race and he has been making the most of every minute of the journey on board ClipperTelemed+. Han, you’re nearing the end of your circumnavigation, what’s it like to be back in Europe with only two short races remaining? I still remember at the start of the race thinking “Wow, this is going to be eleven months,” but now we are here, we have about seven to eight days more sailing and we will be back in London. It’s been very nurturing. I’ve grown as a person, as a sailor, as a Watch Leader and I’ve been very happy this whole race. There have been ups and downs but that is sailing. Overall it’s offered me a lot more than what I expected. I hadn’t really thought beyond the sailing aspect but I’ve grown as a human being, I’ve made a lot of friends and that’s something very important to me. You always seem so busy in port, what roles have you had throughout the journey? I started out as the Team Coordinator and Assistant Watch Leader. Then I become Watch Leader and our Skipper Matt didn’t want me to be taking on too many responsibilities so suggested I pass on the TC role. The boat has a lot of maintenance to get through, so I’ve been doing a lot of the bosun work, the rigging and what not also. I love to learn, so I’ve been learning how to splice, how to fix things, going up the mast and all that. Now I’m taking on the role of victualler as well. What is your favourite role on board? The bowman. I love it. I love helming too. In fact I love most aspects of sailing itself but bowman is my favourite. I love it when you get everything set up right, the hoist goes really well, the take down goes well, that gives me a little tingly feeling. I try to make the most of every moment because at the end of the day no matter how you want to complain about it, the work has to be done. We are in a race and time is critical, everybody has to be doing their best to get things done as efficiently as possible. Arriving third into Derry-Londonderry was the third consecutive podium place for ClipperTelemed+. What has changed or developed on board to bring this success? On a couple of legs we had fewer crew than we do now and in a way that really helped us because it made us more efficient. Now, doing any kind of sail change with six people is normal for us but because we’ve had more people recently, it means we have more man power, everything is done faster. Matt has allowed us to take more ownership because it is our race so we make sail changes and tactical decisions on our own, so we are getting more and more involved in the race. The morale on ClipperTelemed+ is really high right now. Everyone has confidence in our Skipper, our team and in our boat. We know that our boat can take anything so it’s been really good. So the team has come on as a whole, how have you developed personally as a sailor? I’ve definitely become more confident about racing, especially in terms of ocean racing, especially reading the weather and always paying attention to what is going to change, being a bit more cautious of the sky, clouds, wind changing. My skills have grown along with my confidence. What has been the biggest challenge for you the last ten months? To be honest, I think the social aspect is really challenging. Everybody’s priority is different, everybody’s attitude is different, we all have different reasons for doing this race so trying to push and motivate people to do things is really challenging. And what have you enjoyed the most? Friendship. I’ve met a lot of really good people on this race. For instance, Alex Laline another circumnavigator who is our Assistant Watch Leader has become like my little brother. Many people like Barnaby (Webb) and Doug (Miller), I’ve made many good, lifelong friends. Your aim is to bring the race to South Korea. How is that going? I started working on this about eight months before I joined the race and now I look back and I was trying to sell a product I didn’t really understand. But now I have been to 13 ports and seen how the race is received and the impact it can have on Host Ports, I think I can promote it a lot better. I am the first Korean to do the race and I know a lot of people are following my journey. There is another Korean signed up for the next race already, he contacted me online, and I’ve been getting lots of messages through Facebook and Twitter from people asking me all about the race, the training, kit etc. Hopefully more and more Koreans will join. What are your future plans? How do you follow up sailing round the world? I’m going to continue as a sailor. I’ve actually set up a Korean team to take part in the Rolex Sydney Hobart Race this year. I want to do a lot of the big races, like the Fastnet in two years from now. I’m going to do the Transpac too. It’s going to be exciting. I want to participate in the major races and am trying to find links to pitch it to the big Korean companies like Samsung, Hyundai and Kia, so we will see. Have you been to Northern Ireland before? No, I’ve been to the Republic of Ireland before but I’ve never been here. Derry-Londonderry is a beautiful city, the people are so welcoming, it’s amazing. Yesterday, we were having a barbeque and I was having a hard time setting it up and everybody just came out to help. The marina offered us a location where we could barbeque for 25 people and the restaurant right next to the marina, who actually had their own barbeque actually gave us propane gas so we could light ours. We are all really loving it here.